I love camping at a beach by the open sea. We’ve done it at every opportunity, from Connecticut to California. There is something unique about camping at the edge of the ocean. It is one of those places that most people can only visit briefly, for a glorious but all-too-short day at the sandy beach before heading home. But with an Airstream your home can be just a few feet from the beach, providing a comfortable and cozy shelter while you watch the setting sun reflecting on the water, or listen to the endless rhythm of pounding surf. Some of my best camping memories are from beachside places. One of our very first experiences, back in 2004 when our 1968 Caravel was still very new to us, was camping at Charlestown Breachway State Beach in CT. 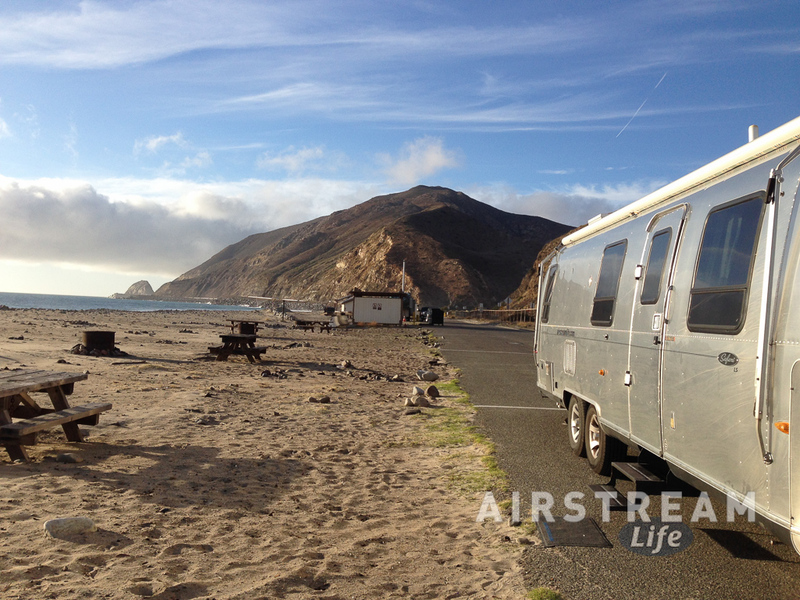 It was just an asphalt lot by the ocean, but being fresh to the Airstream lifestyle, it was a magical time. It probably helped that Emma was just four years old. Everything was pretty magical back then, and it cemented our fondness for beachside camping. Since that first experience we’ve camped by the beach on the Outer Banks of North Carolina, most of the eastern seaboard states, extensively in Florida and the Gulf Coast, Padre Island National Park, Puerto Peñasco and Bahia Kino in Mexico, California, and Washington. The only place we didn’t absolutely love was Bolsa Chica State Beach in Huntington Beach CA, and that’s mostly because heavy highway traffic was obnoxiously close. 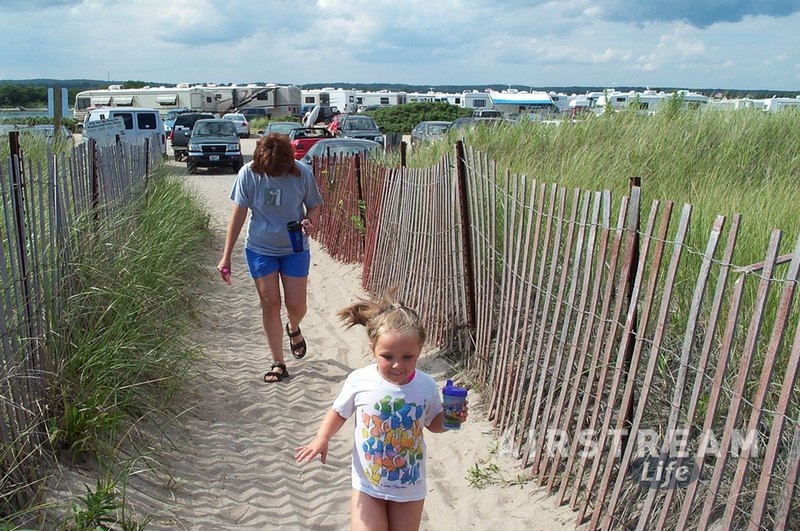 For sure, your camping experience by the ocean can vary quite a lot. It might be peaceful and rustic, colorful and carnival-like, foggy and quiet, or blazing with sunshine and salt breezes. In California there are roads built close to the water nearly everywhere, so often the campsites are just asphalt spots sandwiched between beach and highway. Still, a lot of the sites are pretty nice. The sound of the surf at night is a big part of the attraction for me. I distinctly remember the sound on that first night in Connecticut, and the different sounds we heard one wild & windy night in North Carolina, and yet another memorable night on St George Island (FL) where Eleanor and I stayed up late listening to the waves and talking (that was the night we decided it was time to buy a house after two years on the road). You only get that wonderful sound of waves crashing when you’re camped by the water. On our trip in January this year we visited Thornhill Broome campground (part of Point Mugu State Park), between Oxnard and Malibu. It’s directly adjacent to the Pacific Coast Highway. The beach is rocky but there’s some sand. Like all the west coast sites the water is pretty cold most of the time. No hookups at all, nor dump station, and the gate gets locked at 10 pm. Still, it’s popular because it’s close to Los Angeles and Ventura, and we liked it. If you visit here, try for a weekday to avoid crowds. For practical supplies and services, go north to Oxnard, and for people-watching and an entertaining California scene, go south to Malibu. It’s just a short and scenic drive down the road. Our Airstream friend David organizes an annual get-together of fellow travelers (mostly vintage trailer owners) here every September, so we timed our visit to coincide. That was a good call. 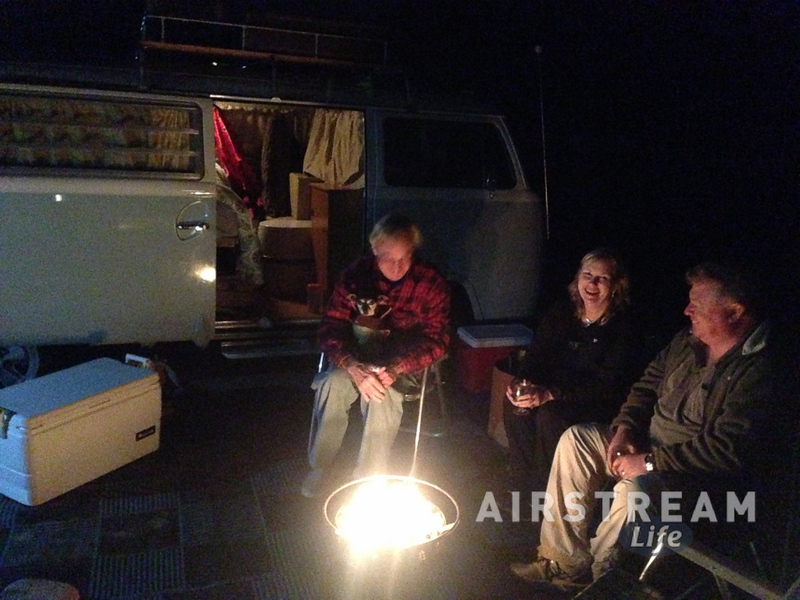 We spent a very pleasant evening with some new friends, sitting in a little courtyard they’d built between a vintage VW bus camper and a vintage Eriba Puck (German camper), while David made chili for everyone and Emma played cards with the other kids in a vintage motorhome. This sort of self-entertainment is “low concept” to many people today. They don’t think they can have a good time without being on an expedition, a cruise ship, or a theme park, but I think we get just as much out of a quiet night with a few good people as anything else we’ve done. I think we all need to do some camping to stay in touch with what’s real, and what matters. Now, I love camping in all sorts of places. Beaches, forests, deserts, even badlands … all of those peaceful places are good for keeping you centered. But beaches will always be special. I don’t know why. I’m just going to roll with it.